Last Sunday afternoon I was thinking of cooking something really quick for dinner, I wanted to do it quick so I can spend more time with my daughter rather than the kitchen. I was also thinking of something I can use left over ingredients, so I opened the cupboard and saw some fettucine and immediately thought of making pasta for dinner. For the sauce I still have some chicken thighs on the freezer and cream and wine on the fridge, that already sounded like a meal just add tarragon then you have a the classic French recipe Tarragon Chicken. 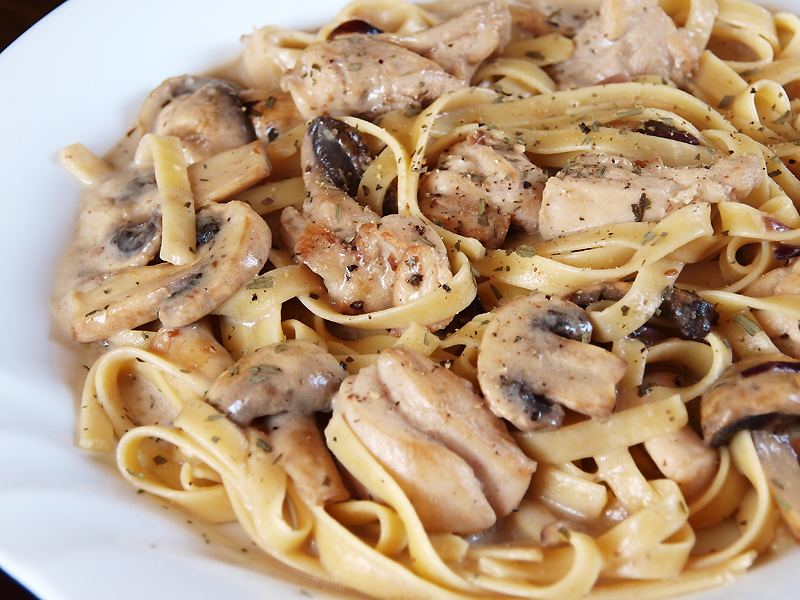 This recipe is a twist to a classic French dish with the addition of mushrooms and serving it over pasta. Commonly this dish is either consumed on its own or served with rice but I guess paring it with pasta will be a good idea because of the creamy sauce and the use of tarragon (which is known to be good for lasagna). So pasta lovers try this one out, its like a marriage of French and Italian cuisines. In a heavy pan brown the chicken pieces. Remove from pan and set aside. Using the same pan, add half of the butter and saute garlic and onions in low heat until brown in colour. Remove from pan and set aside. Now add the remaining butter in the pan and the flour, cook until it forms a roux. Add the chicken stock, wine, chicken, mushroom, bay leaf and tarragon bring to a boil and simmer for 5 minutes. Add cream and the cooked garlic and onions. Season the sauce with salt and pepper. Mix sauce with pasta in a heavy pan over medium heat then serve. What a great comfort meal.